In fall 2016, the Minnesota Corn Growers Association and its grower leaders announced an ambitious goal to become the most sustainable and environmentally responsible corn farmers in the nation. A major part of that goal is to continuously improve the measures implemented by farmers to protect nearby waterways. Minnesota’s corn growers are investing in research and education to better manage their use of nitrogen fertilizer. Since 2014, Minnesota’s corn farmers have invested nearly $6 million of their own funds through the corn check-off in education and research that improves nitrogen management strategies to reduce nitrate loss in water. Today’s farmers are working with researchers at the University of Minnesota to develop practices that reduce nitrate loss in nearby waterways. The multi-million dollar investment has helped farmers accurately assess the fertilizer needs of their crop. By increasing nitrogen use efficiency, farmers are working towards their goal by better protecting the state’s water supply. Minnesota’s corn growers also invested more than $2 million in education to ensure that research reaches the field. One great example of that is the farmer-funded Nitrogen Smart program, which has been attended by more than 600 Minnesota farmers looking to become more efficient in their nitrogen use. Corn farmers, like all Minnesotans, care deeply for the bodies of water that are the defining characteristic of our state. And with that, corn growers have also worked alongside state officials to ensure any on-farm actions to protect our waterways are effective and workable for farmers. 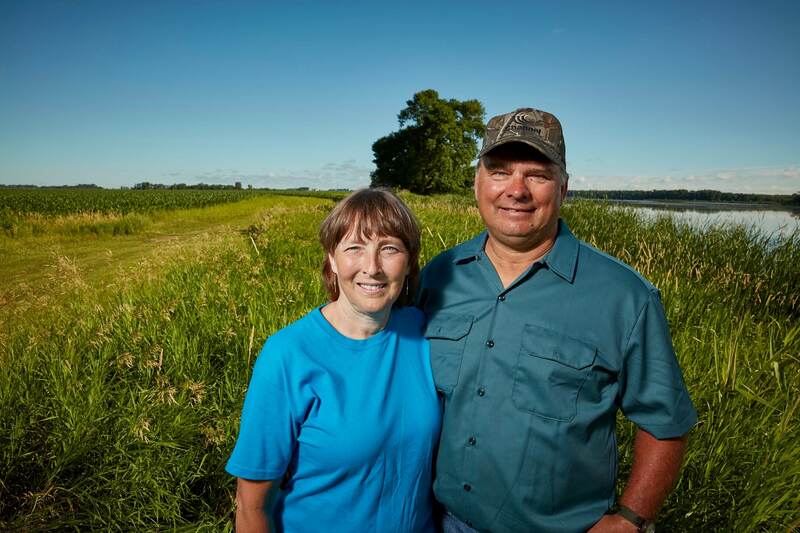 In 2015, the Minnesota Buffer Law required farmers to install vegetative buffers between farmland and waterways. Recognizing buffers are not a singular solution, the state’s corn farmers worked with state officials to develop alternative practices that would provide equal or better effectiveness at protecting and improving nearby surface waters. Farmers now have a suite of options to choose from that best suits their land. Today’s farmers are also more proactive than ever in finding innovation solutions to protect and improve water quality. To fuel that innovation on the farm, Minnesota Corn provides grants to farmers who would like to test an idea of their own. And the return on that investment has been phenomenal. The state’s corn growers invested more than $270,000 in farmer-led projects, including innovative nitrogen application techniques and irrigation techniques that feed the right amount of nitrogen at the right time. Minnesota’s corn farmers are working towards becoming the most sustainable and environmentally responsible corn farmers in the nation. Each farmer knows the important role protecting water quality plays in reaching that goal.